Nine Mountain Schools 禪門九山 (C = Chánmén Jiǔshān, K = Seonmun Gusan 선문구산, J = Zenmon Kyūsan). An appellation for the early schools of Korean Seon (Sŏn) practice. Each school was connected with one of nine mountain monasteries. The nine are listed below. Gaji-san school (迦智山), established at Borimsa (寶林寺) under the influence of Doui (道義; d. 825) and his grand-student Chejing (體澄; 804–890). Doui studied in China under Zhizang (智藏; 735–814) and Baizhang (百丈; 749–814). Seongju san (聖住山) school, established by Muyeom (無染; 800–888) who received his inga 印可 from Magu Baoche (麻谷寶徹; b. 720?). Silsang san (實相山) school, founded by Hongcheok (洪陟; fl. 830), who also studied under Zhizang. Huiyang san (曦陽山) school, founded by Beomnang and Jiseon Doheon (智詵道憲; 824–882), who was taught by a Korean teacher of the Mazu transmission. Bongnim san (鳳林山) school, established by Wongam Hyeon'uk (圓鑑玄昱; 787–869) and his student Simhui (審希, fl. 9c). Hyeon'uk was a student of Zhangjing Huaihui (章敬懷暉; 748–835). Dongni san (桐裡山) school, established by Hyecheol (慧徹; 785–861) who was a student of Jizang. Sagul san (闍崛山) school, established by Beom'il (梵日; 810–889), who studied in China with Yanguan Qian (鹽官齊安; 750?-842) and Yueshan Weiyan (樂山惟嚴). Saja san (獅子山) school, established by Doyun (道允; 797–868), who studied under Nanjuan puyuan (南泉普願; 748–835). Sumi-san school (須彌山) founded by Leom (利嚴; 869–936), which had developed from the Caotong 曹洞 lineage. The term Gusan in Korea also becomes a general rubric for "all the Seon schools," holding such connotations down to the present. 韓国仏教中央博物館 Central Buddhist Museum, Seoul, p. 114.
International Journal of Buddhist Thought & Culture September 2003, Vol. 3, pp. 105-129. Ph.D. Dissertation, University of Florida, Gainesville, Fla., 2011, 308 p.
Korea Journal, Vol. 21. No. 8, Aug., 1981 pp. 32~40. Edited and Translated by Robert E. Buswell, Jr.
III. VARIORUM ON THE "GĀTHĀ ON THE DHARMA NATURE"
It has been taken for 50 years or more since Seon(Zen in Jap./ Ch'an in China/Sitting Meditation in the US) had been introduced as a technique of practice in American society. Many Zen masters came to the States from South-eastern areas; Korea, China, Taiwan, Myanmar, Sri-Lanka, Vietnam, and then they made up a new linage of American Zen, since Suzuki Shunryu(1904~1971) had built San Francisco Zen Center(SFZC) in 1958, in which a hall for practicing and a farm for self-sufficiency are completed. Today, it is due to them that there are the various methods of Zen with many Zen-Centers and web-sites on internet for meditation practice in the States. If we surf on internet for a moment, immediately, we'd find out hundreds of web-sites related with Zen. I heard, that there are about 30 to 50 thousand of Zen Centers in the States, by a Zen-practitioner whom I met, while I was staying in the States in 2004. Among them, first SFZC is organizing 9 Zen Centers around San Francisco, 10 in California area and 14 in the other areas. And Tibetan Shambhalla Center is organizing about 1,500 branches all around the States, IMS(Insight Meditation Society) is organizing about 5 hundred or more, and there are lots of Zen-Centers and practitioners. We can say, the number is not so considerable in the big country, but it is raised up so rapidly for a short period. I classified the groups in the States into 4 methods of practice; Vajrayana Practice by Tibetan gurus, Vippassana Practice by South-eastern practitioners, Mook-jo Seon(Silent Illumination without kong-an/kung-an in China) by Japanese practitioners and Gan-hua Seon(Meditation with kong-an or hua-t'ou) by Korean, Japanese and Chinese practitioners. By the methods, Vajrayana is surpassed others, Vipassana is the next, and then Mook-jo, and the last is Gan-hua. Hereby, specifically I'll look into the Gan-hua Seon method in American society. In the lineage of Gan-hua Seon, there are separated to many families from their own Zen Masters, but I'll study a few big families among them and also study the field related with 3 countries; Korea, China, Japan. I don't want to review the great Zen Masters' biographies, either. So I'd like to mention their activities inside of the States. Joshu Sasaki Roshi(1907~ ) arrived in L.A. on July, 1962, because his teacher asked him to go to America to teach Zen Buddhism and at that time, Dr. Robert Harmon and Dr. Gladys Weisbart had been independently trying to bring a Rinzai Zen monk to L.A. They sponsored Master Joshu Roshi to come to the US. Three year later, Rinjai-ji's main training center, Mt. Baldy Zen center, was opened. This Center has gained a reputation in international Zen circles for its rigorous practice for 19 hours a day. Most of Rinjai-ji's monks and nuns have received some or all of intensive training there. And Michelle Martin who were practicing at Mt. Baldy Zen center, asked to practice in New Mexico area, and then Master, Joshu S, Roshi opened Jamez Bodhi Mandala, now Bodhi Mandala Zen Center in 1974. It became Master J. S, Roshi's second training Center, offering daily Zazen(Ch'am Seon/Sitting Meditation) and communal work practice. In this Center, all practitioners were growing fresh greens and fruits together. It means Zen practice is not different from farming everyday life. For 5 years, Master J. S, Roshi had never tired, offering Zazen(Ch'am Seon/Sitting Meditation), investigating kong-an, having private Dharma meeting in a very small house. He had always served tea, cooked for himself, whenever he met with anyone who came to practice. Specially, to commemorate his fifth birthday in 1967, he began to practice Seven-Day Intensive Retreat(Dai-Sesshin) at first, which has developed to another tradition for practice under the Master J. S, Roshi's teaching. During the Intensive Retreat, practitioners usually do Zazen(Ch'am Seon/Sitting Meditation). Now there are 21 branches in the US under his teaching. It is notable that the Master J. S, Roshi has held the Buddhist Sutra Seminar every summer at Mt. Baldy Zen Center since 1977. Over 16 years, many Buddhist scholars have taken part in the seminar from other countries. Naturally, Rinjai Zen under Master J. S, Roshi's teachings was more prevalent. He has taught his Zen students with old patriarchs' Dharma Talks and interviewed them in the face of him with private until now, though he is walking 98th year. It is interesting that he was familiar with Korean Zen Master, Seung Sahn friendly. And he was very sad, when the Master, Seung Sahn passed away in 2004. Even though Master J. S, Roshi has taught Gan-hwa Seon with kong-ans under Rinzai-ji, I wonder how he has checked the kong-ans for his Zen students. As for me, it was difficult to get the related data more. However, it's obvious that he teaches Zen(Sitting Meditation) with hard, using the traditional method of 'investigating kong-an' and his own modern style. I confirmed to the Zen Center of Master J. S, Roshi a few times, that Master J. S, Roshi gives Hua-t'ou to the Zen students who is needed to test and checks the answers in the face of him. But usually beginners have learned the 'counting breathing' first and then, 'investigating Hua-t'ou' one after another. Until now they have kept on practicing '7-Day Intensive Retreat' one or two times a month, and Master J. S, Roshi has had private interview directly 4 times everyday during the period. At that time, usually he gives big questions(Hua-t'ou) as follow; "Who am I? ", "What am I? ", "What was my original face before I was born? ", "What is it?". However, we couldn't confirm any more because they don't want show their private teachings. They wants to come and ask for their methods of practice the Zen Center, if somebody would have any question. Though Master J. S, Roshi is a Japanese, he has chosen only Gan-hua(Investigating Hua-t'ou), not Mook-jo(Silent Illumination) as the methods of practice. Consequently, Master J. S, Roshi emphasizes that you attain your true nature through the practice with kong-ans, and apply the wisdom into your real life. For the purport, he teaches Zazen(Ch'am Seon with Hua-t'ou), Intensive Retreat(Dai Sesshin), checks the kong-ans(private interview) directly, and 'counting breathing' for the beginners. And on farming greens and fruits, he leads the practitioners to apply daily life with Zen. When he had traveled to the State in 1977, where he had served as the abbot of a temple in New York for a while. And he opened a Ch'an(Seon/Meditation) Center in Queens, New York, to propagate Chinese Ch'an(Zen) in there. In 1978 he became a professor at Chinese Culture Univ. in Taipei. In 1980 he found a Ch'an(Seon/Zen) Center and Chung-Hwa Buddhist Cultural Institute in New York. In 1989 founded the International Cultural and Educational Foundation of Dharma Drum Mountain and reopened the Center in Queens to New York Branch of ICEFDDM. Nowadays there are 24 branches of ICEFDDM in New York. In the Center, there are organizing many programmes as follow; 'One-Day Ch'an Retreat', 'One-Day Recitation Retreat', 'Three-Day Recitation Retreat', 'Seven-Day Intensive Hua-t'ou Retreat', 'Ten-Day Intensive Silent Illumination Retreat', 'Family Zen Camp' and so forth. Specially they have Dharma meeting for questions and answers every programme. Finally, Master Sheng-yen had affected to open the Buddhist subject in almost 40 universities in the US. Currently 3,000 or more Zen students follow him in the States and about 300,000 are learning under his teaching in Taiwan. The Master has published more than 90 books, available in English, Chinese, Japanese, Vietnamese, Spanish, Portuguese, Italian, German, French and other languages. The Master emphasizes not only Gan-hua Seon(Ch'an/Zen), but also teaches sutras, mantra practice, and all the methods for practice. In his Dharma talking, there are basically included the Buddha's teachings, theory of cause and effect, rebirth(samsara), emptiness and so forth. He also applies 'Gan-hua Seon(investigating kung-an)' of Lin-Ji(Rinzai) School, 'Mook-jo Seon(silent illumination without kung-an)' of Cao-Dong(Soto) School and 'Ji-kwan(止觀/ Great Shamatha)' of T'ien-t'ai School for practice. Regardless of the methods, he uses all the types for practice like; 'counting breaths', 'reading sutras', 'invoking mantra', 'reciting buddha's names', 'walking meditation', 'investigating Hua-t'ou', 'silent illumination' and others. 'Ch'an encompasses four key concepts: faith, understanding, practice, and realization. Faith belongs to the realm of religion; understanding is philosophical; practice is belief put into action; and realization is enlightenment. Without faith, we cannot understand; without understanding, we cannot practice; and without practice, we cannot realize enlightenment. Together, these four concepts create the doorway we enter to attain wisdom. "4) It means that the Master thought all the methods of practice are related with each other. In practicing meditation, Master Sheng-yen explained very simply. For beginners sitting postures on the cushion and the way of counting breaths is taught first. It is important that body and mind be relaxed. If one is physically or mentally tense, trying to meditate can be counter-productive. Sometimes certain feelings or phenomena arise while meditating. If you are relaxed, whatever symptoms arise are usually good. It can be pain, soreness, itchiness, warmth or coolness, these can all be beneficial. But in the context of tenseness, these same symptoms may indicate obstacles. The methods of Ch'an(Zen) that the Master, Sheng-yen has taught in the States are divided into three stages. The first stage is to balance the development of body and mind in order to attain mental and physical health. The second is free from the sense of the small "I". The third is free from the large "I" to no "I". The method of the first stage is very simple. Mainly it requires you to relax all the muscles and nerves of your entire body, and concentrate your attention on the method you have just learned. With regard to the body, we stress the demonstration and correction of the postures of walking, standing, sitting and reclining. Because the tension of your muscles and nerves affects the activity of the brain, the key is therefore to reduce the burden on your brain. In the second stage you begin to enter the stage of meditation. When you practice the method of cultivation taught by your teacher, you will enlarge the sphere of the outlook of the small "I" until it coincides with time and space. The small "I" merges into the entire universe, forming a unity. When you look inward, the depth is limitless; when you look outward, the breadth is limitless. Since you have joined and become one with universe, the world of your own body and mind no longer exists. What exists is the universe, which is infinite in depth and breadth. You yourself are not only a part of the universe, but also the totality of it. In the third stage you realizes that the concept of the "I" does not exist. But you have only abandoned the small "I" and have not negated the concept of basic substance or the existence of God; you may call it Truth, the one and only God, the Almighty, the Unchanging Principle, or even the Buddha of Buddhism. If you think that it is real, then you are still in the realm of the big "I" and have not left the sphere of philosophy and religion. What is the Master's methods for Ch'an(Zen) practice? He showed two styles for getting enlightenment; Gan-hwa Seon(Ch'an/Zen) with hua-t'ou of Lin-Ji(Linjai) School and Mook-jo Seon(Silent Illumination without hua-t'ou) of Cao Dong(Soto) School. Both of them enables us to be relaxed physically or mentally, and concentrate on mindfulness. The purpose of practicing Ch'an is to "Illuminate the mind and see into one's true nature." This investigation is also called " Clearly realizing one's self-mind and completely perceiving one's original nature." There are many hua-t'ou as such; "Who is dragging this corpse around?" "All dharmas return to one, where does this one return to?" "Before you were born what was your original face?' and "Who is reciting Buddha's name?" is common. In fact, all hua-t'ou are the same. There is nothing uncommon, strange, or special about them. If you wanted to, you could say: "Who is reciting the sutras?" "Who is reciting the mantras? "Who is prostrating to the Buddha? " Who is eating?" "Who is wearing these clothes?" "Who's walking?" "Who's sleeping?" They're all the same. Hence, hua-t'ou's involving the word "who" are wonderful methods for practicing Ch'an. You have to investigate the great doubt, whenever you walking, standing, sitting and reclining. A necessary element of Hua-t'ou practice is the presence of a sense of doubt. It doesn't mean thinking or considering of an idea repeatedly. By the Great doubt, it means a burning, uninterrupted persistence to get the root of a question which is unanswerable. That is the core of Gan-hua Seon practice. However, the Master couldn't speak English. So, he called Jeong-sun, Kim who was a professor for the Uni. of Rhode Island State, and began to propagate his Zen talks for his Zen students in his house with him. Before long time, the more people came to listen to his Zen talks at his small house. So, the Master lent a small apartment in Providence and began to transmit his Dharma Talk in there, and then around 50 to 90 Zen students gathered to listen per week. Finally, October 10th of the year, Providence Zen Center was opened with great. As the Dharma meeting at Providence had developed, so many lay-people came to become one of his Zen disciples from all the areas. Consequently, he opened Cambridge Zen Center in Massachusetts in 1974, New Haven Zen Center in Connecticut in 1975, and Dharma Zen Center in L.A. in 1976, one after another. From 1976, Seung-Sahn Zen Master has affected on lay-people very tremendously. For his teaching style, he has taught Zen students directly in the face of him, and corresponded with them frequently. Specifically, Stephen Mitchell who was called Ven. Moo-Gak as his buddhist name, published "Dropping Ashes on the Buddha in 1976", which is the collections of the Master's Dharma Talks, questions & answers with his students, stories for the old Zen masters or patriarchs, and the letters corresponded with his American Zen students and so forth. In a twinkle, the book was recorded as a best-seller on the list, and then many people who read it wanted to become his disciples eagerly. Until now, in the US, there are opened 29 Zen Centers, and so many people are practicing Korean Seon(Zen/Meditation) under his teaching in there. The core of his teaching is 'see your true nature!' and practice to attain the 'true nature', as it is just substantial world for us. The Master said, "The most important thing that characterized their practice is that they simply looked inside, very deeply inside, to find their true nature. This is how the Buddha's first students attained his teaching, preserved it, and passed it down to us. "9)There are layed emphasis on the 'attain true-nature' through his all teachings. The Master pointed that the true nature is already realized as it is. Everything is already truth, and true Dharma. Zen Master, Seung-Shan admits all the styles of Buddhist practice to attain the true nature. He didn't insist on any special word, any meaning or any form to get enlightenment. Though our goal is to attain true nature ultimately, every technique will be helpful for us as the above; reading sutra, invoking the name of the Buddha, mantra practice, and meditation. "No matter what the tradition, the point of any meditation practice is to help you realize your own original nature so that you can help all sentient beings get out of suffering. Meditation(Zen) is not about making something special. It is not about having some peaceful experience of stillness and bliss. "13) The most important thing is finding your true nature, not the technique, the Master means that. Hereby, Zen Master, Seung-Shan specially teaches Gan-hua Seon as a technique for practicing. In his teaching there are two types of kong-ans(hua-t'ou/ big question); one is for looking inside, and the other is for testing the hua-t'ou(big questions) as follow; 'Who am I? ', 'What am I? ', 'Only don't know!' and so forth. "There are many, many teaching words in this book. There are Hynayana word, Mahayana words, and Zen word. There are Buddhist and Christian words...........too many words! But all of these words are not necessary. Words and speech are only thinking, and thinking makes suffering. You must throw them all in the garbage! The reason for this is that our true nature is not dependent on understanding. This is why I only teach "don't know."....... "Don't know" is not Buddhist or Christian or Zen or anything................I only teach 'don't know'"15) Master said, 'never forget these big questions, 'Only don't know! ', 'What am I?' and so forth. Not holding One Mind, but perceiving your correct situation in your everyday life using the kong-ans. His teaching means that practice to attain your true nature using kong-an, and get wisdom in everyday life. On these days, it is important to apply the kong-ans in our everyday living. These kong-ans were conventional methods for the Zen masters to review if their students got the right view through practicing in the past. As the above, Seung Shan Zen Master's Gan-hua Seon is composed of practice and checking with his kong-ans,"Only don't know!" and so forth. This style is a little different from traditional practice in Gan-hua Seon of Korea. Traditionally, kong-ans(hwa-t'ou) are used to get enlightenment with practice. However, Zen Master, Seung Shan is using them to quest and answer for checking. He applies them in everyday life as conventional methods to get wisdom and to realize right view from moment to moment. All the 3 Zen Masters do not insist on Gan-hua Seon only. They are using all the methods for practice such as; Mook-jo Seon practice, reading sutra, invoking mantra, counting breaths and so forth. If some monk said that I solved one Hua-t'ou, the Masters never admitted him to be a realized man. Because they are all stand for gradual enlightenment, rather than sudden enlightenment. Moreover, the Zen Masters give the big questions and check the answers to their Zen students in the face of them. By using kong-ans, the Masters lead their students to look back on their self-nature, and apply the attainments to everyday life. Hereby, I'd like to summary the patterns of Gan-hua Seon practice in the US. First, all the Masters have practiced strongly under their own Buddhist views. Second, they are emphasizing on the ultimate attainment of practice, not their own methods for practice. Therefore, they are using all kinds of methods to teach their Zen students such as; counting breaths, invoking mantra, reciting buddha's names, reading sutras, prayer chanting and so forth. Third, they are stand for gradual enlightenment, not sudden enlightenment for practice. There are 3 stages to get enlightenment. Masters gives kong-ans to the practitioners every stage and checks the answers. Fourth, the Masters give hua-t'ou to their Zen students for contemplating original self-nature. Not only traditional kong-ans, but also common questions like 'Who am I?' are given to them. Fifth, the Masters give questions to the Zen students and check the answers continuously. Specifically, this is the main method that the Zen Masters teach their students. Sixth, the Masters teach to the practitioners Zen practice, and also to apply what they have learned or attained to their own everyday lives. The Zen Masters have found many Zen Centers in the US for themselves to teach their students, and they have already been able to speak English. Furthermore, now they are transmitting Dharma to the native Americans in active. For long time, the Zen Masters have considered how to teach the American lay-people and finally they got what the Western Zen practitioners want. Even though their methods for teaching are a little different from traditional styles, those are by far the best for the American practitioners, I think. However, I regret that I haven't studied how the Zen Masters could overcome the cultural or social gaps between the countries, and teach the foreign people in the face of them directly. And I wonder how their teachings affected to the U.S. society or inspired to every Zen student spiritually. I haven't looked for any social or environmental effects derived from the Masters' Zen teachings yet. If I had an opportunity, I would review all the above and the prospects of Zen Buddhism for the future in the States. 9) "The Compass of Zen", Zen Master Seung Sahn, compiled and edited by Hyon-Gak Sunim, (Shambhalla, Boston& London, 1997.) p249. In: Aspects of Korean Civilization. Ed. by Birtalan Ágnes. Budapest : Eötvös Lóránd University, Dept. of Inner Asian Studies, 2002. pp. 4–12. Számos koreai tanulmányozta a csant Kínában, és hazatérésüket követően vezető tanítványaikkal megalapították saját iskoláikat különböző hegyi kolostorokban. Kezdetben ezeknek az iskoláknak a száma kilenc darabban volt meghatározva. Balogh Tibor: Sŏn mesterek a 20. század első felében. In: Aspects of Korean Civilization. Ed. by Birtalan Ágnes. Budapest : Eötvös Lóránd University, Dept. of Inner Asian Studies, 2002. pp. 4–12. Birtalan Ágnes: Korea, a Hajnali Üdeség Hona : Koreai vallások : Buddhizmus 1. In: Selyemút : Ázsiai kultúrák folyóirata, 1997. I. évf. 1. szám. pp. 24–27. Birtalan Ágnes: Korea, a Hajnali Üdeség Hona : Koreai vallások : Buddhizmus 2. In: Selyemút : Ázsiai kultúrák folyóirata, 1997. I. évf. 2. szám. pp. 8–9. Birtalan Ágnes: Korea, a Hajnali Üdeség Hona : Koreai vallások : Buddhizmus 3. In: Selyemút : Ázsiai kultúrák folyóirata, 1997. I. évf. 4. szám. pp. 11–12. Buswell, Jr., Robert E.: Podzso Dzsinul élettörténete. [Tracing Back the Radiance : Chinul's Korean Way of Zen (részlet)]. [angolból] Ford. Szigeti György. In: Kopár hegycsúcs : Zen mesterek élete és tanítása. Ford., szerk. és vál. Szigeti György. Budapest : Farkas Lőrinc Imre Kiadó, 1996. pp. 33–43. Hamar Imre: Wonhyo's Influence on Chengguan. In: Proceedings of the International Conference Dedicated to the Twentieth Anniversary of Diplomatic Relations between Hungary and the Republic of Korea (1989–2009) : Eötvös Loránd University Budapest : November 12–14, 2009. Budapest : Eötvös University Press, 2010. pp. 89–94. Hegedűs Róbert: Podzso Csinul, a koreai szon buddhizmus legkiemelkedőbb alakja. [Szakdolgozat]. Budapest : A Tan Kapuja Buddhista Főiskola, 1995. 47 p.
[Kim Yi-na, 김이나, 金理那] Kim, Lena: The Diversity and Transformation of Goryeo Buddhist Sculptures. 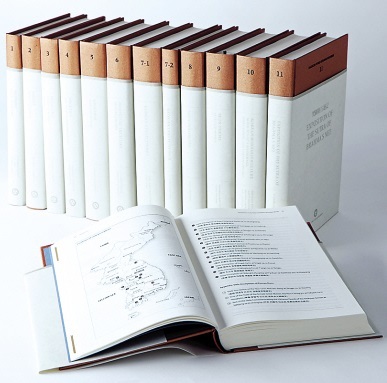 In: Proceedings of the International Conference Dedicated to the Twentieth Anniversary of Diplomatic Relations between Hungary and the Republic of Korea (1989–2009) : Eötvös Loránd University Budapest : November 12–14, 2009. Budapest : Eötvös University Press, 2010. pp. 65–76. Mecsi Beatrix: Az „Átkelés a nádszálon” legenda eredetének kérdéséről. In: Távol-keleti Tanulmányok. I. évf. 2. szám. Budapest : ELTE Távol-keleti Intézet, 2009. pp. 103–122. Mecsi Beatrix: The Representation of the Lonely Saint (Dokseong) in Korea's Buddhist Monasteries. In: Proceedings of the International Conference Dedicated to the Twentieth Anniversary of Diplomatic Relations between Hungary and the Republic of Korea (1989–2009) : Eötvös Loránd University Budapest : November 12–14, 2009. Budapest : Eötvös University Press, 2010. pp. 77–88. Nagy Zsófia: Koreai zen : tradíció és tanítás. [Szakdolgozat]. Budapest : A Tan Kapuja Buddhista Főiskola, 2000. 51 p.
[Pojo Chinul, 보조지눌, 普照知訥] Podzso Csinul: Az igaz tudat érzékcsalódásának eloszlatása. [Chinsim chiksŏl, 진심직설, 眞心直說 (részlet)]. [angolból] Ford. Szigeti György. In: Zen tükör : A Zen Kvan Um Iskolájának magazinja, 1995. III. évf. 3. szám. pp. 12–14. [Pojo Chinul, 보조지눌, 普照知訥] Podzso Csinul: Nyílegyenes tanítás az igazi tudatról. [Chinsim chiksŏl, 진심직설, 眞心直說 (részlet)]. [angolból] Ford. Ford. Szigeti György. In: Zen tükör : A Zen Kvan Um Iskolájának magazinja, 1994. II. évf. 4. szám. pp. 9–12. [Pojo Chinul, 보조지눌, 普照知訥] Podzso Dzsinul: Nyílegyenes tanítás az igaz tudatról. [Chinsim chiksŏl, 진심직설, 眞心直說]. [angolból] Ford. Szigeti György. In: Kopár hegycsúcs : Zen mesterek élete és tanítása. Ford., szerk. és vál. Szigeti György. Budapest : Farkas Lőrinc Imre Kiadó, 1996. pp. 45–82. Rikker Zsuzsanna: A Tan átadásának változása a zen kialakulásától napjainkig. [Szakdolgozat]. Budapest : A Tan Kapuja Buddhista Főiskola, 2004. 80 p.
Szigeti György: Szung Szán zen mester élete és tanítása. [Szakdolgozat]. Budapest : A Tan Kapuja Buddhista Főiskola, 1996. 76 p.
A téma iránt érdeklődők számára kiváló forrás a Zen tükör : A Zen Kvan Um Iskolájának magazinja, mely 1993–1996 közt háromhavonta jelent meg.